The SPDI Passive Direct Box features a 1/4" high-impedance I/O plus balanced and floating low-impedance XLR output that ignores phantom power. Lift mode severs ground connection between the input and the XLR output. GND mode leaves ground connection intact between input and XLR output. 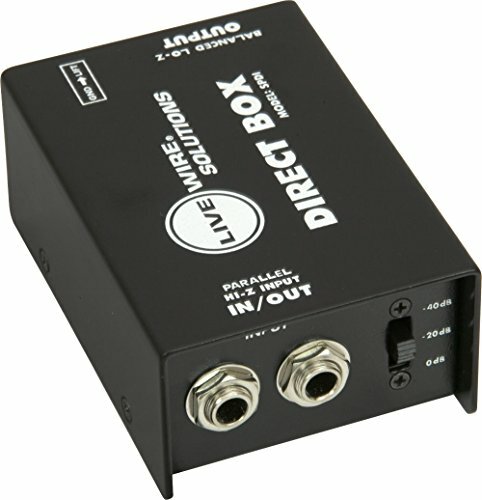 The SPDI passive direct box from Live Wire Solutions features a 1/4" high impedance instrument input and output plus balanced and floating low-impedance XLR output that ignores +48V phantom power. Variable attenuation provides maximum input flexibility, while Lift mode severs ground connection between the input and the XLR output. GND mode leaves ground connection intact between input and XLR output.